A few weeks after the storm over whether or not the Queen supported Brexit deserves a more detached look. What actually happened was that The Sun ran a provocative piece on 9 March 2016, claiming that the Queen backed Brexit. The assertion was that she had “rip at the then Deputy PM [Nick Clegg] during a lunch at Windsor Castle”. Clegg rapidly tweeted “As I told the journalist this is nonsense. I’ve no recollection of this happening & its not the sort of thing I would forget” and the BBC ran a story about Buckingham Palace being clear that she was neutral over Brexit. As the lunch in question was in 2011 it is stretching things to construe whatever was actually said as a comment on the forthcoming referendum. At this distance it might also be quite hard to be sure of what was said and what people wish she had said. I don’t pretend to know the Queen’s private views on this, but the whole episode raises someone in the role of the Queen might respond to the EU, in terms of the role itself, history and the constitution. The constitutional dimension is both the easiest and hardest to pick up. With no written constitution, the tendency is for things to evolve. Eurosceptics might want to say fearful things about how the Queen’s role has changed because of EU membership. The pragmatist in me wants to point out that the UK leaving the EU would fuel pressure for Scots independence, so the biggest change in her role would be adjusting either to being Queen of a Scotland that is not in political union with the rest of the UK, or to no longer being Queen of Scotland. Either way, the British constitution has evolved in a fairly pragmatic way, and doubtless that pragmatism would continue. My reading of the story in The Sun was that it was trying to mobilise the Queen as a patriotic focus. One of the consequences of her many decades of explicitly not getting involved in politics is that there is nothing to contradict people who think they know what she thinks. Part of me wants to think about that in terms of what the psychoanalytic world calls “projection”, where what a person thinks they see is shaped by their own unconscious processes. In looking at processes in groups and organisations, a useful idea is that people sometimes act out things on behalf of a group. Sometimes that is about what they actually do, and sometimes it is about what they are seen do to. In this case my attention is caught both by the roles of The Sun and of the Queen. In running this story, The Sun will have had a shrewd sense of what their readership would want to project onto her. It sounds as if they found a way to cast her in the role of “saving the nation”. That speaks volumes for the Sun editor’s view of the fears of their readers: I suspect that many of these are people for whom the EU is sufficiently unfamiliar to feel sinister and alien. Those are irrational and unsubstantiated fears. If they are projected onto more-or-less anyone but the Queen, they could well turn round and say otherwise, but they are easier to put onto a Queen who does not make her actual views public. 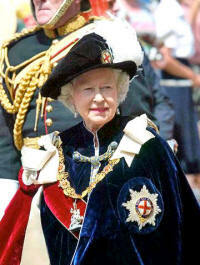 The Queen herself, in the modern role of a constitutional monarch, she ends up representing Britain to itself. That is a complex, half-articulated set of feelings associated with being British which operate at a gut level. In a way that is hard to express, it gives her a weight that is more significant for not being wielded. On the serious side, an obvious example is the way an outgoing Prime Minister advises her to invite whoever has a majority in the Commons to form a government — with no sense of political partiality, providing stability as things change. On the humourous side, the episode in the opening ceremony of the 2012 Olympics which seemed to show her jumping with James Bond from a helicopter into the stadium caught British humour at its best — neatly involving the Queen to do so. Going back many centuries, the monarch — almost always the King – was the person who could muster enough of an army to control the country. Those days are a long time ago: the last King of England to die in battle was Richard III in 1485. But relics and memories of that royal role lie in the regiments for whom the Queen is “Colonel-in-chief”, the tradition of princes serving in the armed forces. More sharply, it is in the proclamation “the king is dead, long live the king” — asserting that one king having died, the heir is immediately king, to minimise the chances of someone seizing the throne by force. Wars do enormous damage. For centuries, royal families married to cement alliances. Wars between England and Scotland finally became impossible when James VI of Scotland also found himself as heir to the English throne, so it became impossible for a King of Scotland to ride at the head of an army against the King of England. It won’t escape the reader that one of the fundamental reasons for forming the European Coal and Steel Community (which has developed into the EU) was to make another war in Europe impossible. In this case, the raw materials for mid-twentieth century warfare were coal and steel, and the best insurance against war was to interconnect these industries. But there is a second layer to this. Across Europe, the trend has been from monarchs ruling by the sword to alliances by marriage. The resulting web of inter-marriages among the royal families of Europe was a reasonably effective way to avoid war and build alliances. It did create a culture of marrying out of duty rather than love. One of the reasons for me being highly suspicious of the story in The Sun is that the Queen seems to have that sense of duty at a very deep level, making it very unlikely that she would be so indiscrete. Phrased another way, that was a tradition of monarchs acting in the best interests of their people. There’s room for a discussion of how good the judgement was, but the sentiment was about building alliances to create stability in a pragmatic, and sometimes less-than-elegant way. That is more-or-less exactly what the European Union does, not as some evil super-state, but as a way of enabling co-operation and the peaceful resolution of disputes. Ironically, for Sun readers, if the EU were to seek to have a monarch, the Queen would be a very strong candidate, precisely inter-marriage means she is part of most of the royal houses of Europe. I don’t know what the Queen herself thinks, but as a pragmatic way of developing, peace prosperity, culture and possibility, the EU as an evolving organisation seems utterly consistent with the best of monarchy. The tricky part about this is that it is easier to project things onto individuals than organisations. The EU is structured in a way that avoids giving undue prominence to individuals. That is wise, and allows for some much more sophisticated functioning, but it creates a problem with the primitive anxieties that children deal with by projecting them onto parents, and adults deal with by projecting onto quasi-mythical figures like the Queen. Regardless of the facts behind the story in The Sun, the fact that it was published and believed by at least some people, expresses some raw fears. What people need to discover is that those fears are irrational, and that their assumption about the Queen’s position says more for their fears than it does for the good of the nation. The sad part is that, if we did leave the EU, the people whose standard of living would suffer most, sadly, are the economically disadvantaged — over-represented among Sun readers.